Last month I reported that Trumbull CT homes sales had 'jumped' in July. They jumped again in August, but off the cliff. See annual chart below for the visual. History does repeat itself though. A little further research shows Trumbull's highest sales month to be July and if not, sales carried into a better August. Trumbull CT home sales for August 2015 showed a 16% decrease in sales from the same period last year. 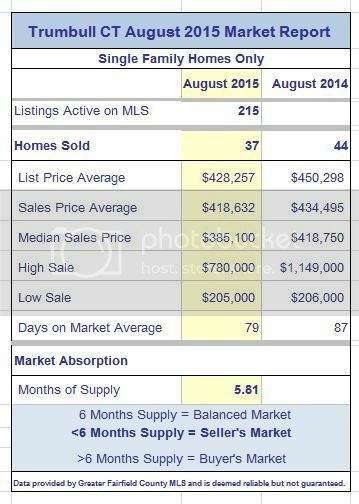 The average listing and selling prices for August were down 5% and 4% respectively as compared to August 2014. The median home price was down 8%. Going forward, there are 42 homes under deposit and 36 sales pending. Days on the market went DOWN 9%. 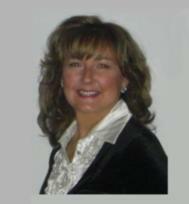 The market absorption rate went up a few months to 5.81 which is statistically in a seller's market. This means at the current pace, it would take 5.81 months to sell off the inventory of 215 homes. Inventory went up but the lower sales pushed the rate up. Homeowners, if you are thinking of selling, take advantage of a complimentary FREE market analysis on your Trumbull home today. The sweet spot for sales in August 2015 remained in the popular $300K - $400K range with 30% of sales! Not as strong as usual flanked closely by its neighboring ranges. No matter which range your home is in, get it prepared to sell with effective pricing, (see Home Seller Mistakes blog post above) staging, and marketing and you WILL be packing your bags! 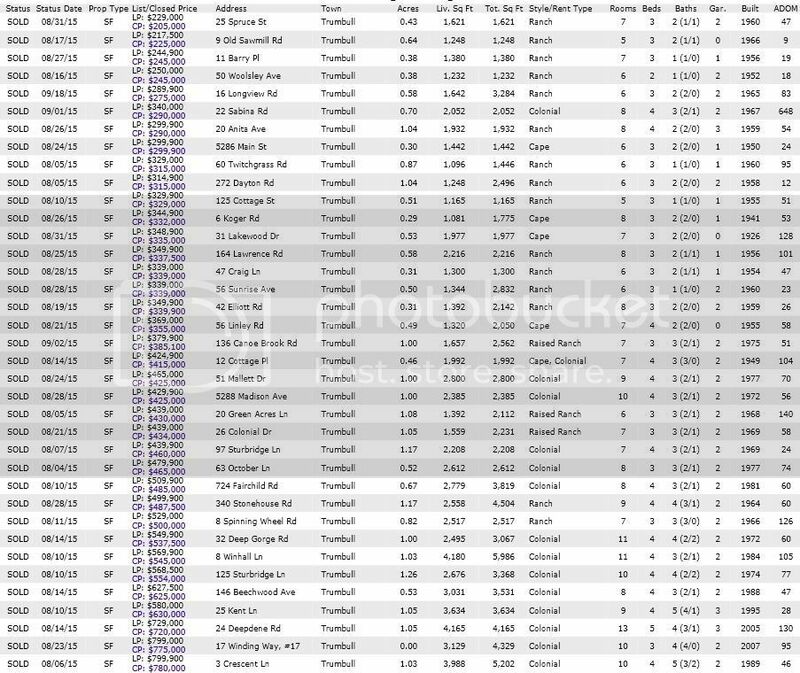 Which houses attracted buyers and sold in Trumbull CT in August 2015? The absorption TREND, which shows the number of months it would take to sell the entire inventory at the same pace, came in at 4.16 months for the last three months. This number went up only very slightly from last month. 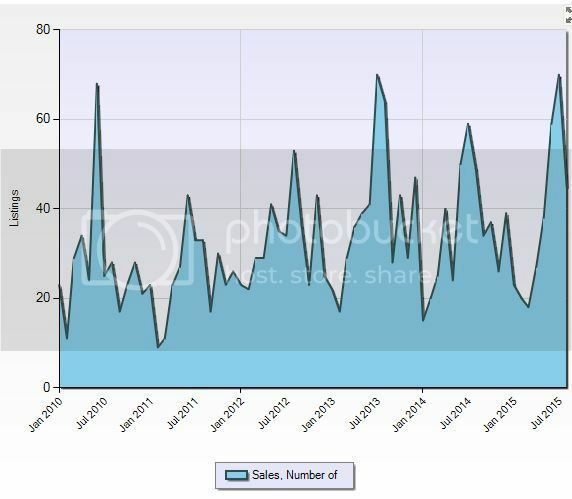 Oops..... sales lost its footing a bit after that very strong showing in July! 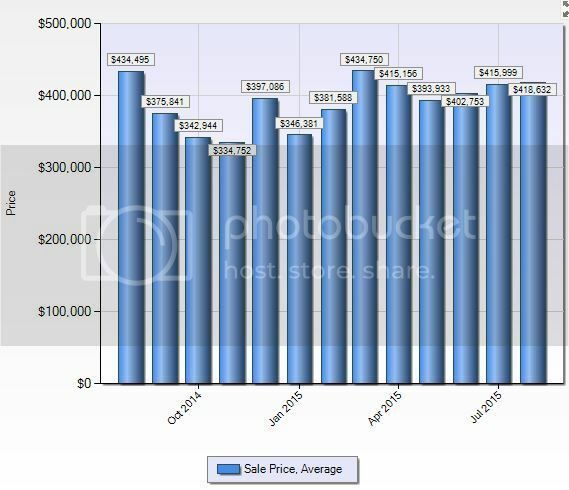 The closed sales price average for the last four months does show a steady increase.... and stability. 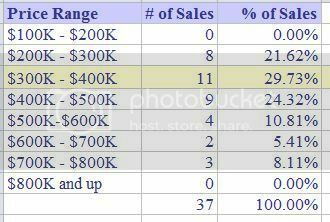 Date Source: Greater Fairfield County Multiple Listing Service -- September 27, 2015 No representation or warranty is made to the accuracy of this information.